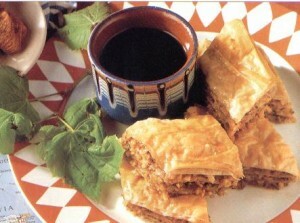 Easy Homemade Baklava recipe by bestchefs at DesiRecipes.com. Make a thick paste of corn flour and water. Keep aside. Cut each samosa patty into 3 to get 75 mm. x 62 mm rectangles. Mix all the ingredients for the filling together and divide into 6 equal portions. Place the filling on one rectangle taking care to leave the sides clean. Place another piece of samosa patti on top and seal the edges using the corn flour mixture. Repeat with other rectangles to make 5 more baklavas. Drizzle with honey and serve hot. what did you do with the cornflour??? ?